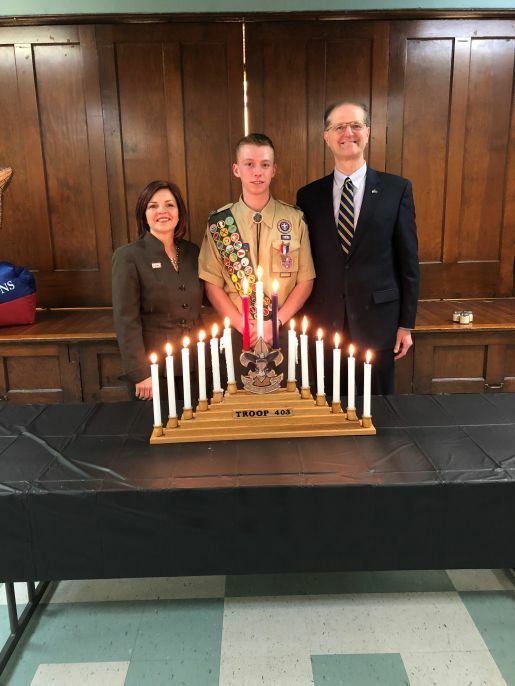 I recently presented a citation to Daniel Landers from Clarion County recognizing him for earning the rank of Eagle Scout. Daniel joined Cub Scouts in the first grade and is currently a member of Troop 403. For his Eagle Scout project Daniel designed, secured funding for, and facilitated the building of two raised bed gardens outside of the Redbank Valley High School Greenhouse. PENNDOT is inviting high school students from several local counties to participate in a “Paint the Plow” art program. The program challenges teens to take a pre-determined safety theme and incorporate it into an original mural that they paint on a snow plow blade of a PENNDOT truck. April 28 is National Prescription Drug Take Back Day, an opportunity to remove opioids and other unused medicines from homes where they can be stolen and abused by family members and visitors. More than 18 tons of prescription drugs were disposed of across Pennsylvania in the October 28, 2017 Prescription Drug Take Back Day. Locations to safely dispose of unused drugs are listed at https://takebackday.dea.gov/. The Pennsylvania Department of Military & Veterans Affairs (DMVA) is currently conducting an online survey to identify issues of concern to Pennsylvania’s approximately 60,000 women veterans. The survey will be available through June 18 at https://www.surveymonkey.com/r/PADMVAWomenVeteransSurvey. Survey topics include benefits and services, access to health care and veterans’ service organizations. The data submitted by respondents will be used by DMVA to recommend policies or procedures that address issues women veterans face as a result of military service. The Pennsylvania State Police and Pennsylvania American Legion are seeking applicants for “State Police Youth Week,” a summer leadership camp designed for teenagers interested in pursuing a career in law enforcement or the military. The week-long camp is staffed by members of the Pennsylvania State Police, Pennsylvania Army National Guard, and Pennsylvania American Legion. During the camp, cadets take part in team-building exercises, physical fitness training, classroom activities involving police and military careers, and a marksmanship course. Cadets will also visit the Pennsylvania State Police Academy in Hershey and Fort Indiantown Gap National Guard Training Center in Lebanon County. The camp will be held at York College in York, Pennsylvania from June 10 through 16. Boys and girls interested in applying for the camp must be between the ages of 15 and 17 prior to entering the camp and not reach the age of 18 during the camp. Applicants are expected to have a good academic record and be in good health. For application information, visit the Pennsylvania American Legion website at www.pa-legion.com and click on the “Programs” link or call the Pennsylvania American Legion Headquarters at (717) 730-9100. Teens attend the camp at no cost, as their local American Legion post sponsors their attendance. In addition to State Police Youth Week, regional Camp Cadet programs are also hosted by state police personnel. The week-long Camp Cadet programs are for boys and girls ages 11-15. To inquire about the availability of a Camp Cadet near you, contact your local state police barracks. Traffic deaths in Pennsylvania reached a new low in 2017, dropping to 1,137, the lowest total since the state began keeping track of the incidents in 1928, according to PENNDOT. Overall, the 2017 total was 51 less than the fatalities recorded in 2016. Fatalities in impaired driver crashes dropped from 341 in 2016 to 246 in 2017. Unrestrained fatalities also decreased from 408 in 2016 to 378 last year. There were 150 pedestrian deaths in crashes in 2017 compared to 172 in 2016. There were some types of crashes which saw fatality increases in 2017. There were 153 fatalities in crashes involving drivers aged 75 years or older, up from 132 in 2016. Also, fatalities in red-light running crashes increased to 35 from 28 in 2016. Also, fatalities in work zone crashes increased from 16 to 19.